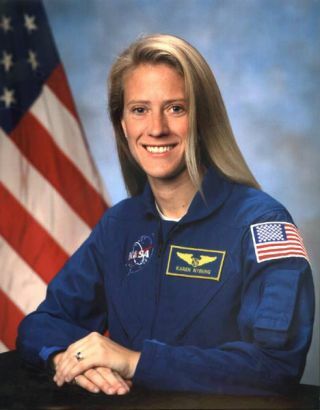 NASA astronaut Karen L. Nyberg poses for a portrait. PERSONALDATA: Born onOctober 7, 1969 in Parkers Prairie, Minnesota. Her hometown is Vining, Minnesota. Recreational interests include art, running, volleyball, sewing, backpacking,piano, and spending time with her dogs. Karen's parents, Kenneth & PhyllisNyberg reside in Vining, Minnesota. EDUCATION: Graduated from Henning Public High School, Henning, Minnesota, 1988. B.S., Mechanical Engineering, Summa CumLaude, University of North Dakota, 1994. M.S., Mechanical Engineering, University of Texas at Austin, 1996. Ph.D., Mechanical Engineering, University of Texas at Austin, 1998. SPECIALHONORS/AWARDS: UNDYoung Alumni Achievement Award (2004), Space Act Award (1993); NASA JSC PatentApplication Award (1993); NASA Tech Briefs Award (1993); NASA JSC CooperativeEducation Special Achievement Award (1994); Joyce Medalen Society of WomenEngineers Award (1993-94); D.J. Robertson Award of Academic Achievement (1992);University of North Dakota School of Engineering & Mines MeritoriousService Award (1991-1992). Recipient of numerous scholarships and other awards. EXPERIENCE: Graduate research was completed atThe University of Texas at Austin BioHeat Transfer Laboratory where sheinvestigated human thermoregulation and experimental metabolic testing andcontrol, specifically related to the control of thermal neutrality in spacesuits. NASAEXPERIENCE: Co-opat Johnson Space Center from 1991-1995, working in a variety of areas. Shereceived a patent for work done in 1991 on Robot Friendly Probe and SocketAssembly. In 1998, oncompleting her doctorate, she accepted a position with the Crew and ThermalSystems Division, working as an Environmental Control Systems Engineer. Herprime responsibility involved using human thermal physiology and engineeringcontrol for improvements in the space suit thermal control system andevaluation of firefighter suit cooling technologies. Otherresponsibilities included providing computational fluid dynamic analysis forthe TransHab module air distribution system, coordinating and monitoringanalysis tasks performed by a team of contractor personnel for the X-38environmental control and life support system, providing conceptual designs ofthe thermal control system for the Advanced Mars and Lunar Lander Missionstudies, and environmental control system analysis for a collapsible hyperbaricchamber. Selected asa mission specialist by NASA in July 2000, Dr. Nyberg reported for training inAugust 2000. Following the completion of two years of training and evaluation,she was assigned technical duties in the Astronaut Office Station OperationsBranch where she served as Crew Support Astronaut for the Expedition 6 Crewduring their six-month mission aboard the International Space Station. Dr.Nyberg is currently assigned duties in the Space Shuttle Branch and theExploration Branch. She will serve in technical assignments until assigned to aspace flight.